The reliability of IVECO engines is well known from the commercial vehicles. IVECO offers special genset diesel engines in the power range from 25 upt o 1.000 kW. Besides good quality and service this engines are characterized by a good price quality ration. 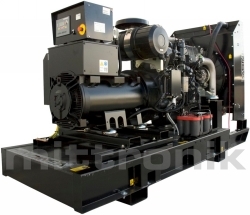 MITTRONIK offers generators with slow turning IVECO diesel engines from 60 up to 450 kVA rated power. The MIW series soundproof generators have optional extra large double-walled fuel tanks 225 to 2.100 liters volume.